← Please show me the steps on how to get a clear grayscale ras when converting pdf to ras. PCL is short for Printer Command Language, which is not widely supported for general document viewers on personal computers. For some reasons, many notes or report forms are stored in digital file format of PCL, and, if you want to publish or transmit them, you may have to convert them into other file formats. TIF is a popular image format that is widely accepted by most image viewers. This article will present a method of converting documents of PCL to tif format using VeryPDF PCL Converter. 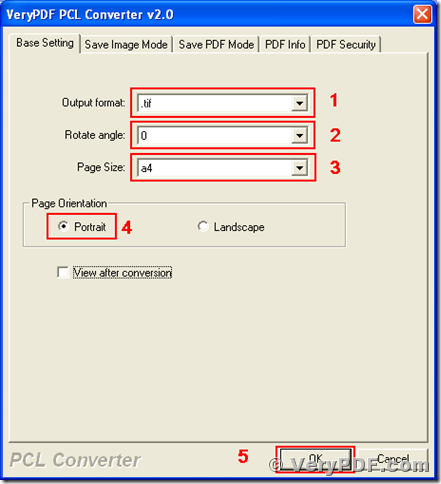 VeryPDF PCL Converter is a useful tool for converting formats of pcl, pxl, px3 and pm to others frequently used file formats, such as tif, pdf, jpg, bmp. This program has two versions, of which one is GUI version and the other is command line version. For using the program, you should download VeryPDF PCL Converter from http://www.verypdf.com/pcltools/index.html and install it onto your Microsoft Windows Operating System installed computer. After the installation, you will see an executable file named “winpcl.exe”, which is the key component of PCL Converter, the GUI. You can start the GUI program with double-clicking on the icon of it or following the menu path, [start] –> [All Programs] –> [VeryPDF PCL Converter v2.0] –> [VeryPDF PCL Converter v2.0]. You can press the “Try” button in the dialog box on its startup, to evaluate the unlimited full function of PCL Converter. The screen snapshot is the GUI main window of VeryPDF PCL Converter. The first step of converting your documents of pcl to tif is adding those files into the file list in the main window of VeryPDF PCL Converter. There are four ways to add pcl files, or other documents of supported formats, e.g., px3, pxl, to the file list. In the main window, follow the menu path [File] –> [Add Files], then browse to the files in the popup dialog of Windows file picker. In the main window of PCL Converter, follow the menu path [File] –> [Add Directory], then browse to the directory in the dialog of “Browse for Folder”. In the main window, press the button of “Add File(s)”, then browse to those files via the popup dialog of Windows file picker. Drag those files from the Windows Explorer window and drop them into the main window of VeryPDF PCL Converter. The second step is using the one of the following methods to set the conversion parameters. In the main window of PCL Converter, follow the menu path [File] –> [Settings], then you will see a setting dialog. In the main window, press the button of “Setting”, then you will see the same setting dialog as the first method. In the tab “Base Setting” of setting dialog with tile of “VeryPDF PCL Converter 2.0”, choose “.tif” in the dropdown list of “Output format”, select “0” in the dropdown list of “Rotate angle”, choose “A4” in the dropdown list of “Page Size”, select the radio button of “Portrait”, and then press “OK”. These operations are for converting pcl to tif, and there are as well some options for the conversion in the tab of “Save Image Mode”. The other tabs, “Save PDF Mode”, “PDF Info” and “PDF Security” are for converting pcl to pdf. Finish the settings, and then come to the main window of PCL Converter, the last step is pressing the “Start” button and choosing a directory in the dialog of “Save As”. After executing those operations above, those files of pcl will be converted from pcl to tif. Those files of pxl will be converted from pxl to tif, and those of px3 from px3 to tif. 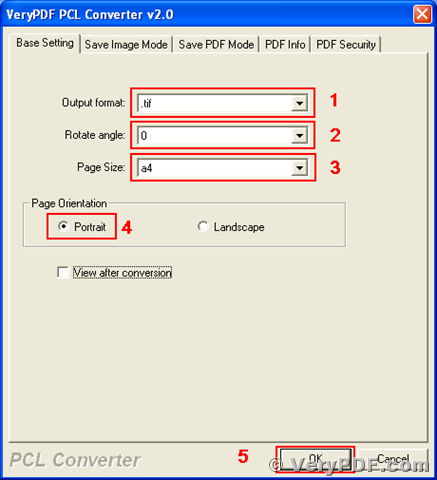 VeryPDF PCL Converter is able to convert pcl to pdf and to other image formats, and you will find more information about the program at http://www.verypdf.com/pcltools/pcl-tools-help.htm. If you wish to use the registered version without any limitation, please buy a license for your PCL Convert via http://www.verypdf.com/order_pcl2pdf_end.html. This entry was posted in VeryPDF Blog and tagged PCL Converter, PCL to PDF, PCL to TIF. Bookmark the permalink.